Square Group is the leading UK Apple Premium Reseller with five locations in the UK offering a complete and complex range of services from Apple sales through to service, support and Eduction to both professional and consumer clients alike. In 2010 Square formed Square International offering a complete range of enterprise Hospitality Solutions including their flagship product Square [ i ]. Resolution Creative have the pleasure of working closely with Square Group on a number of high profile projects as their preferred agency of choice, in this case to create a platform for visitors to explore all the intuitive features that make up Square International. Resolution Creative's goal was to create a platform which exposed the technology and services on an enterprise level and to allow the user to experience and understand the products informatively that make Square International. Resolution Creative worked with Square in the design phase to create a slick friendly brand and visitor experience showcasing the range of products, features and services available from Square International. With design in hand, we set out to make the concept a reality utilising a bespoke content management system (CMS) which would cater for the complete requirements of Square International. Our team worked closely with Square Group throughout the development phase to make sure all the details were finely tuned and optimised to meet the client's requrements. Square International was a challenge to break ground with new additions to our already established and widely used Aristos CMS system, in that we have to deliver a functional and informative web platform with an extended variance of capabilities. 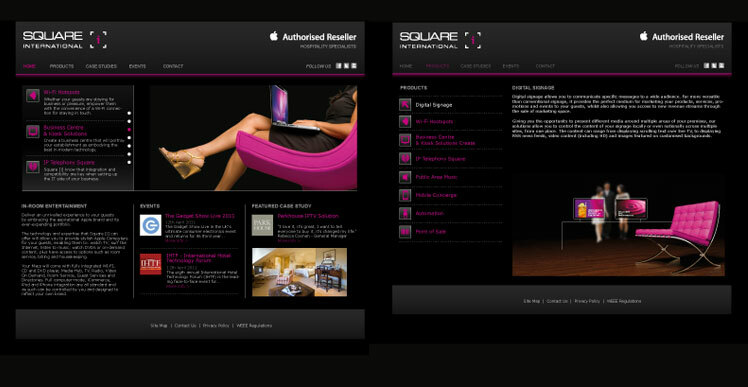 On completion, we are proud to hand Square Group an online presence which we hope reflects a market leading persona.